Chocolate mini bunnies. Bite size chocolate bunnies wrapped a in bright foil. 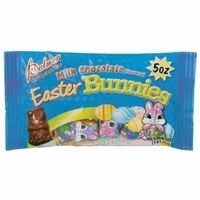 These solid milk chocolate flavored bunnies are perfect Easter Basket fillers. Each chocolate Easter Bunny is approx. 1" so they will also fit nicely in your Easter Eggs. Each 4oz. bag contains approx 10 chocolate bunnies.